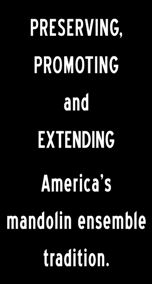 The Seattle Mandolin Orchestra accepts bookings of all kinds: concerts, dinner music, or special events. You may book either the full orchestra (20+ members) or the 4-member SMO Quartet, consisting of players from each section of the orchestra. We have a vast library of music and can present programs based on different themes, e.g., Italian, American, international folk music, or Christmas/holiday selections. Visit our MP3 page or MySpace page for samples. The full orchestra rate is $500 for the first hour and $250 for each additional hour. The quartet rate is $300 for the first hour and $150 for each additional hour. We perform within the Puget Sound region, but can arrange to travel further abroad for additional considerations. For more information, or call (425) 673-0263. Also available for booking: the Seattle Mandolin Ensemble, a small group performing repertoire from Bach to Black Sabbath. Call (206) 595-7206 for more information.